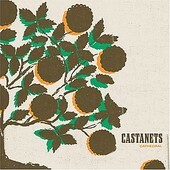 Folk-based, Americana-infused, with a helping touch of dissident indie-rock, The Castanets'Cathedral is a dark, drawn out, slow moving collection of lo-fi sounding tunes that run the gamut from the rocking ("Industry and Snow") through haunting acoustics ("The Smallest Bones"). Taking you into a mysterious place, the songs come and go, lasting only a few minutes, but leaving a lasting impression far beyond their run time. Cathedral is seemingly a concept album, one that, if you get wrapped up into it, makes the album that much more enjoyable. But, even if you don't, there are still a few songs here and there that make it worth your while. Though, it times it drags too much and is a difficult listen, so if you don't put in the time, you won't get the reward. I'll give it a B-.